Once your little one arrives, please contact me so we can set a definite date for your session. I prefer to do newborn sessions when baby is 7-12 days old. If you should deliver earlier no worries, I will fit you into my schedule. The session takes place in the client's home, preferably in the nursery, master bedroom, and living room. We can also take some photos outdoors if the weather permits (ideal for spring and summer due dates!). Do not worry about your house being a mess—you just had a baby! All you need to do to prepare is open the blinds/curtains to let in as much light as possible. I'll quickly push things out of the area I'm shooting so that your home will appear to be spotless in the photos. Don't be surprised if I move some furniture around, I'm just working to get the best light in your home. I'll put it all back where it was! The only thing I will ask you to do is have your bed made with a neutral quilt/comforter on top. Your bed makes for a great place for cuddly family photos! 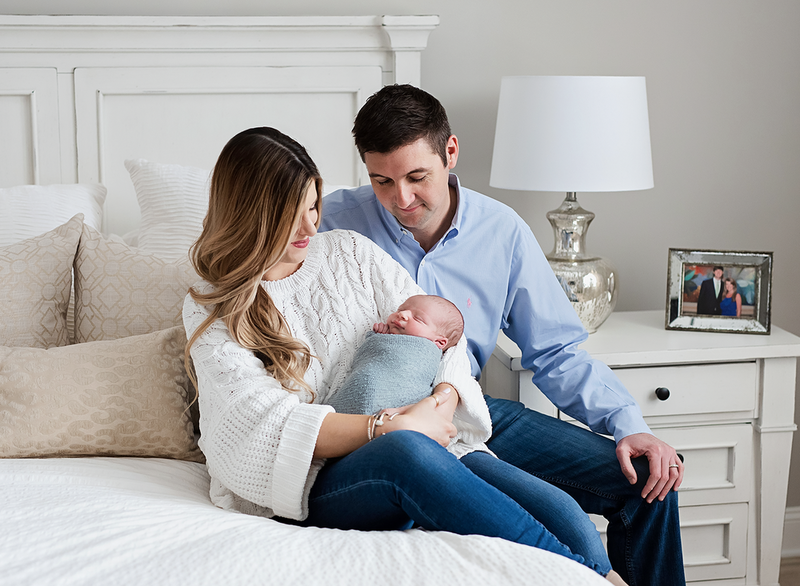 How can I make sure my baby is comfortable and cooperative during the shoot? Newborns are unpredictable and this shoot is all about them. Please do not worry about your baby crying or needing to eat during the shoot—newborn sessions are purposely longer to allow for plenty of breaks, feedings and even diaper/outfit changes. It’s usually a good idea to try and feed your baby right before the session so they’re sleepy and content. What should my husband and I wear? I recommend keeping it simple and comfortable. Neutral, light (creams, whites or grays) work best as they don't take away from the natural beauty of your baby. You can add pops of color to your outfit, if you wish, by using jewelry or accessories. Skip the busy patterns for this type of session; you want the viewers eye to be drawn right to the baby. Solid tops (and textures like big knits and lace) work best. Stay away from prominent logos or writing on clothing. For your husband, the same rules apply. What should the baby wear? I prefer babies dressed very simply in plain onesies, muslin swaddles, or just diaper - whatever their comfort level is. Do you use props or specialize in stylized newborn poses? Rather than posed newborn shots, I love to capture the relationship between the new baby and his/her parents and siblings. This doesn’t mean that I won’t take individual photographs of the baby and capture some great detail shots of his/her little toes and fingers. I am happy to incorporate any ideas you might have! Feel free to incorporate any special family quilts, heirlooms or baby blankets that you would like to use in the photos. How long are these sessions? A typical lifestyle newborn session takes 2-3 hours. When it comes to a newborn session, the baby is in charge, so we allow time to enough feeding and diaper changing breaks. What can I do to prepare for the session? This is such a special time in your family’s life. There will be so many emotions during the shoot—love, excitement, wonder, amazement. It will be tough, but try to relax! Moms tend to stress out because this is a new experience and because they want things to be “perfect.” I will take your baby’s lead and allow him/her to be the focus of the shoot. If your baby cries, or poops, it’s okay. I promise! Just focus on relaxing and cuddling with your sweet new addition and I will create images that you will cherish forever! You can order images and products through your gallery. If you choose to have them printed elsewhere, I have listed some professional photo labs below. I do not recommend printing your images at Walmart, Walgreens or Sam’s. The colors will look totally different as they are not a professional photo lab. If you print larger than a 15X11 please contact me so I can resize to the appropriate dimensions for printing.